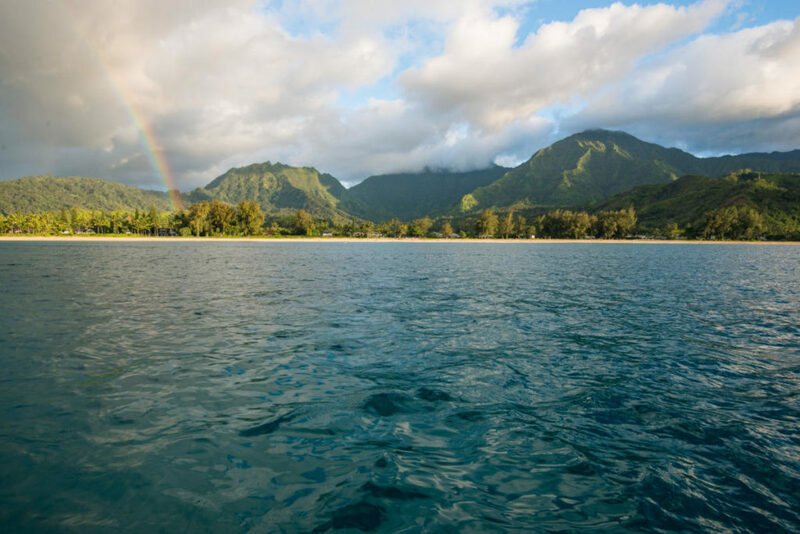 While many people gravitate to the island’s sandy south shore, Princeville is a lush escape that has vast stretches of sand, great waves for surfing, and cute towns to explore. The North Shore is one of the best places to stay on the island. There are plenty of Princeville, Kauai, things to do, so make sure to get out and enjoy all it has to offer. Princeville is located on Kauai’s north shore, about 45 minutes from the Lihue Airport. 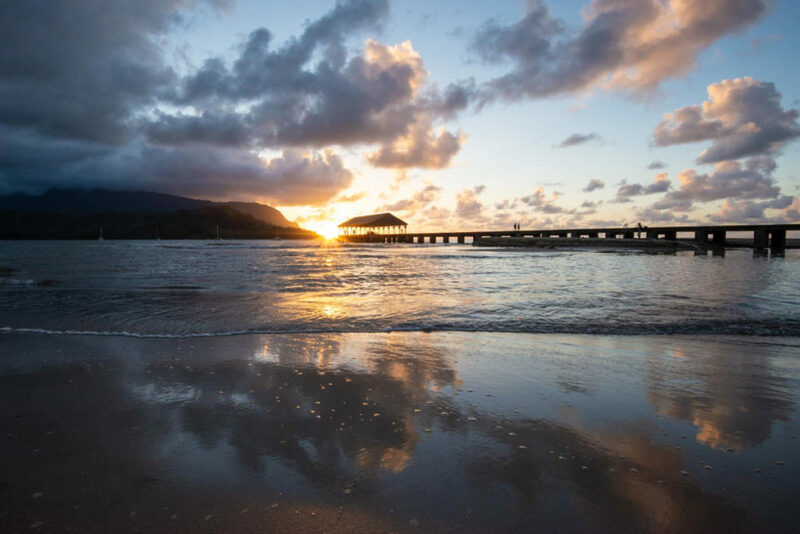 It is located near the town of Hanalei, dubbed by some as the island’s hippest town. 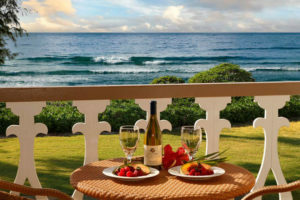 Princeville offers a variety of Kauai resorts with views of both the ocean and the surrounding cliffs and rainforest. Princeville is known for its stunning natural beauty, dramatic cliffsides with views of the Pacific, and master-planned community of upscale homes. While it might not be hot and sunny like the South Shore – it gets about 85 inches of rain per year – it’s the reason for Kauai’s nickname, the Garden Isle. Because of its lush tropical rainforests – it’s the only U.S. state that has them – Kauai’s North Shore has been used as a location for a number of films. Most of Jurassic Park’s dinosaur scenes were shot around Princeville and Hanalei, as well as scenes as the first of the 1980s Indiana Jones trilogy, Raiders of the Lost Ark. Princeville is full of exciting activities for the adventurous visitor to the island of Kauai. If you love nature and outdoor activities, be sure to spend some time in Princeville. What could be better than zooming through the air strapped into a cable above a lush tropical paradise, the ocean breeze in your hair? 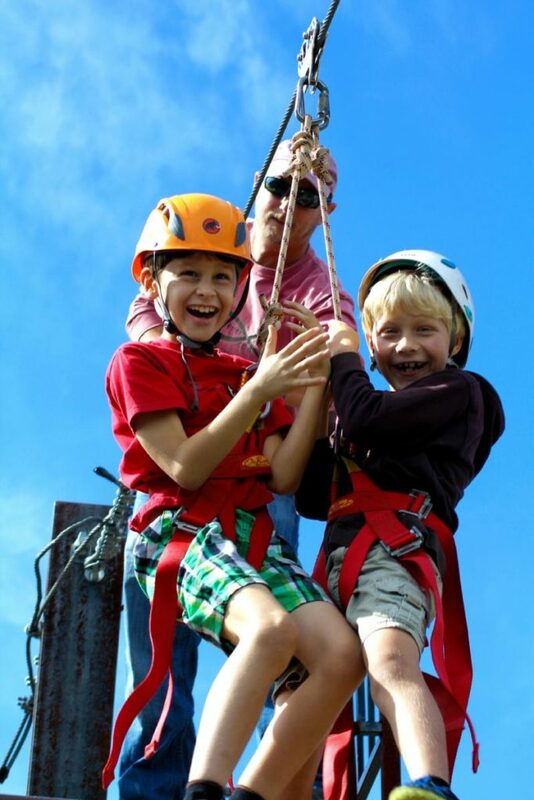 Princeville offers zip line adventures for all ages and skill levels. You don’t have to be a superhero to fly through the air when you’re in Princeville. Imagine riding a trusty steed across 2,500 rolling acres of the North Shore land. Watch herds grazing peacefully on grass-covered hills and see cow hands plying their trade on a modern-day working ranch. Take a ride to a magnificent waterfall and see one-of-a-kind natural treasures you’ll not soon forget. Local stables and guides are available for your convenience. Princeville Botanical Gardens is consistently rated one of the most popular attractions in all the Hawaiian Islands. Not only does it give visitors the opportunity to see remarkable examples of tropical plants and trees, it treats them like royalty with delicious servings of local fruits and decadent chocolates. This is an absolute must during your Kauai getaway. A helicopter tour might not be the most conventional way to get around the Kauai, but it definitely offers the best view. 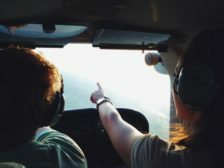 Seasoned helicopter guides will give you a bird’s eye view of stunning Princeville and the entire island, pointing out sites and answering your questions about this ancient and mysterious land. Princeville is home to a world-class golf course, the Makai Golf Club, ready and waiting for you. Here’s your chance to play the game of kings in one of the most beautiful settings on earth. Try one of their famous sunset golf games for an extra special time on the green. 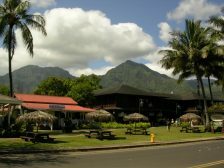 Princeville is not only famous for its abundance of Kauai Island, Hawaii, things to do, but also for its shopping and dining. Grab a bite to eat at the romantic Kauai Grill, an upscale steakhouse inside the St. Regis Princeville. Alternatively, dine outside at Makana Terrace, an inventive seafood restaurant overlooking Hanalei Bay. If you’re looking for something unique, try Kauai ONO 560, a pop-up that serves fine dining out of a food truck under a tent. The best part? It’s BYOB. From Hawaiian-style seafood to pizza to ice cream shops, Kauai’s North Shore has tons of incredible dining experiences. If you’re looking for places to stay in Kauai, look no further. 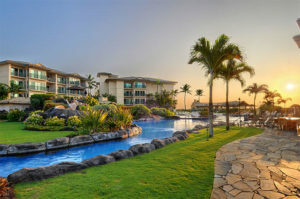 We offer fantastic Kauai resorts and condo rentals all over the island. Stay right in Princeville at our elegant condos with a waterfront view. 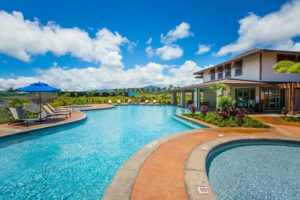 Alternatively, stay halfway between the north and south shores at Waipouli Beach Resort and Spa. Whether you’re looking to stay on the North Shore for the week or visit for a day, there are plenty of Princeville, Kauai, things to do that will make your island vacation unforgettable.